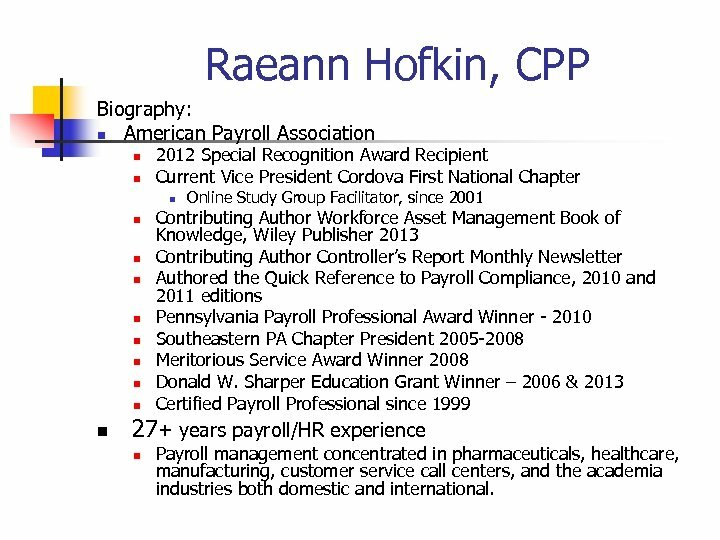 Raeann Hofkin, CPP Biography: n American Payroll Association n n 2012 Special Recognition Award Recipient Current Vice President Cordova First National Chapter n n n n n Online Study Group Facilitator, since 2001 Contributing Author Workforce Asset Management Book of Knowledge, Wiley Publisher 2013 Contributing Author Controller’s Report Monthly Newsletter Authored the Quick Reference to Payroll Compliance, 2010 and 2011 editions Pennsylvania Payroll Professional Award Winner - 2010 Southeastern PA Chapter President 2005 -2008 Meritorious Service Award Winner 2008 Donald W. Sharper Education Grant Winner – 2006 & 2013 Certified Payroll Professional since 1999 27+ years payroll/HR experience n Payroll management concentrated in pharmaceuticals, healthcare, manufacturing, customer service call centers, and the academia industries both domestic and international. 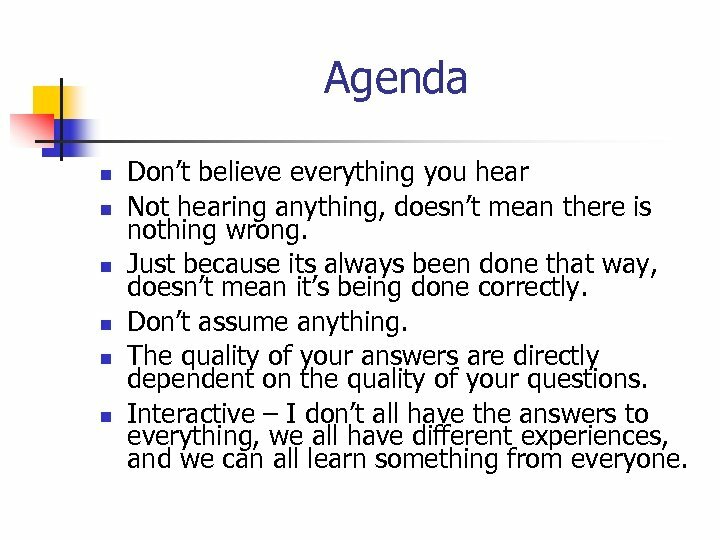 Agenda n n n Don’t believe everything you hear Not hearing anything, doesn’t mean there is nothing wrong. Just because its always been done that way, doesn’t mean it’s being done correctly. Don’t assume anything. The quality of your answers are directly dependent on the quality of your questions. Interactive – I don’t all have the answers to everything, we all have different experiences, and we can all learn something from everyone. 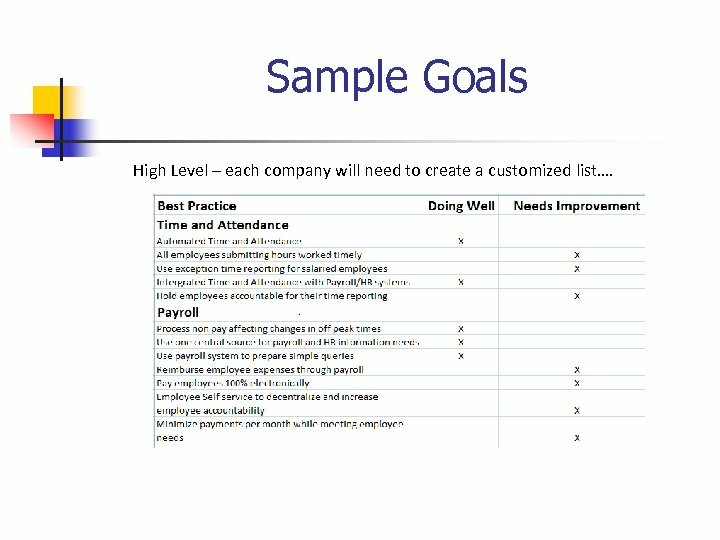 Sample Goals High Level – each company will need to create a customized list…. Reports Provided n n n Who? What? Why? 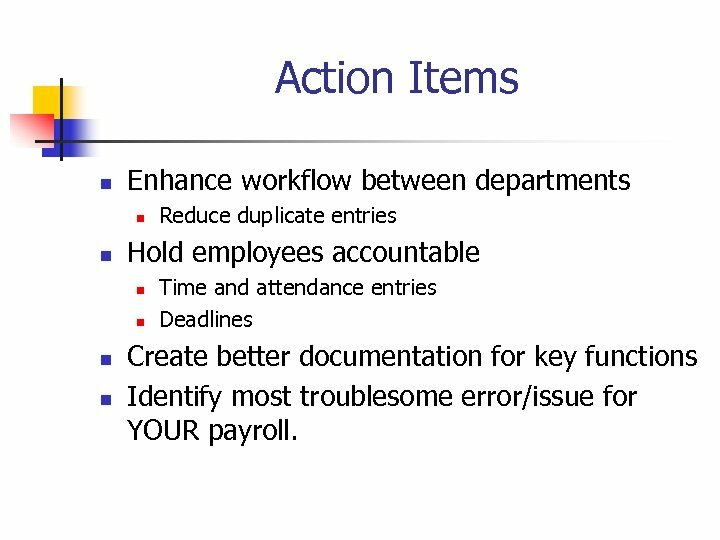 Action Items n Enhance workflow between departments n n Hold employees accountable n n Reduce duplicate entries Time and attendance entries Deadlines Create better documentation for key functions Identify most troublesome error/issue for YOUR payroll. 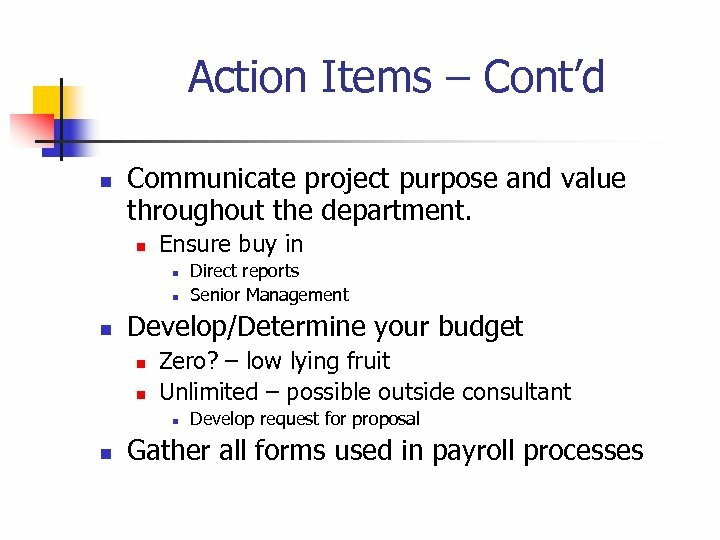 Action Items – Cont’d n Develop Strategy to integrate payroll, benefits, HR, and time and attendance. 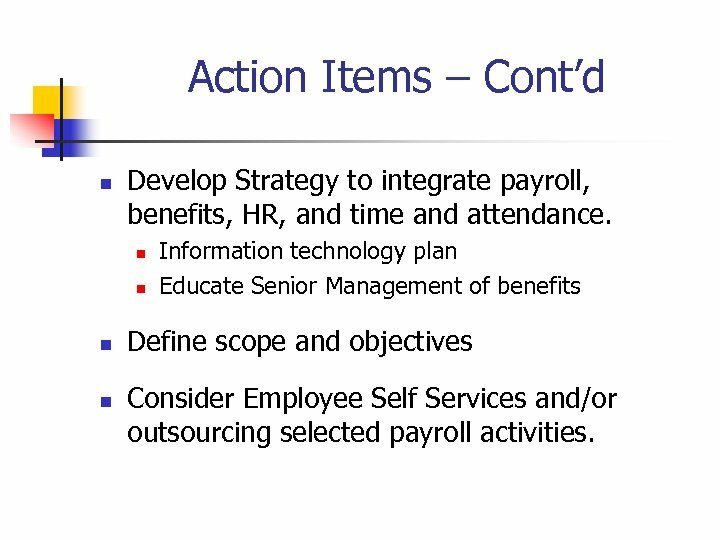 n n Information technology plan Educate Senior Management of benefits Define scope and objectives Consider Employee Self Services and/or outsourcing selected payroll activities. 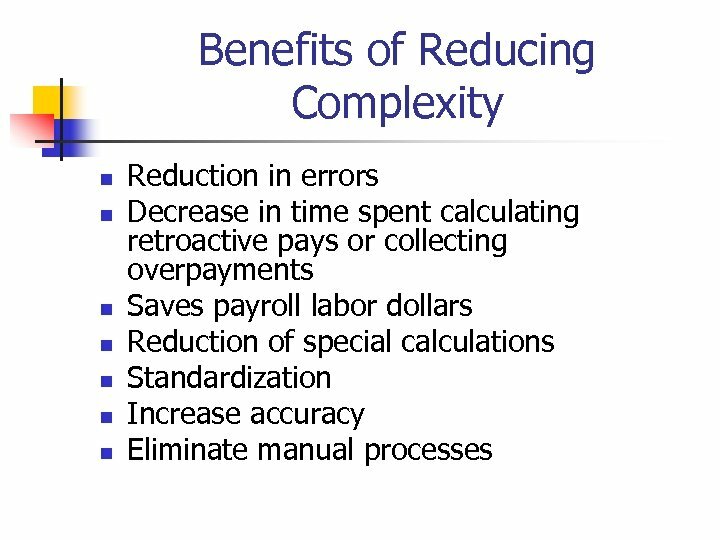 Analyze Off Cycle Checks n Labor intensive & Time consuming n n n Research & Analyze Calculate & review Processing correction Track down check signer What is the root cause? 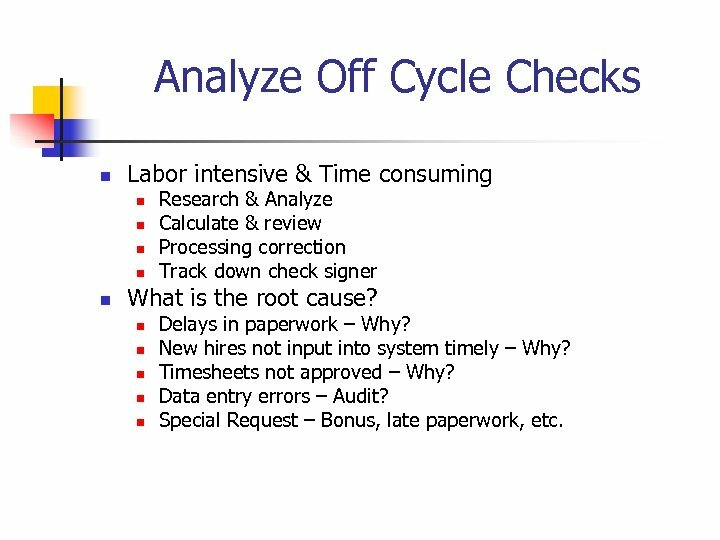 n n n Delays in paperwork – Why? 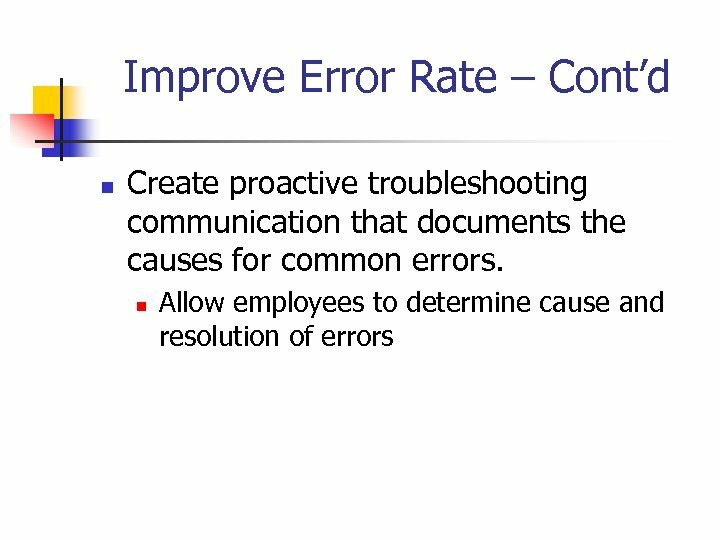 New hires not input into system timely – Why? Timesheets not approved – Why? 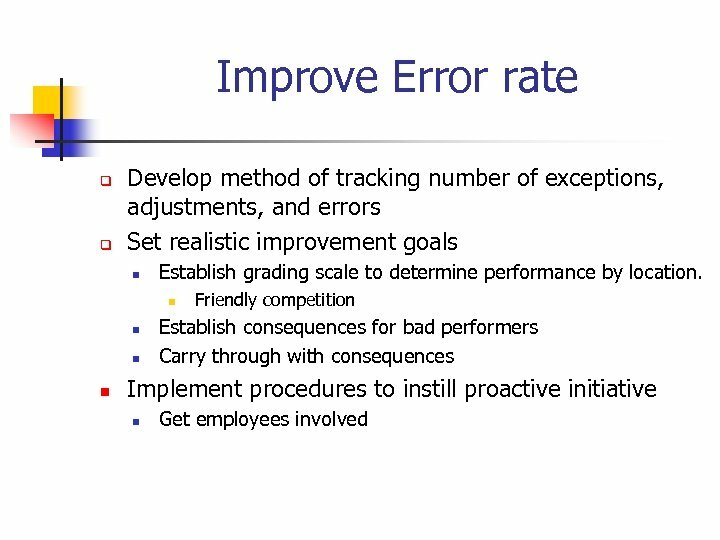 Data entry errors – Audit? Special Request – Bonus, late paperwork, etc. 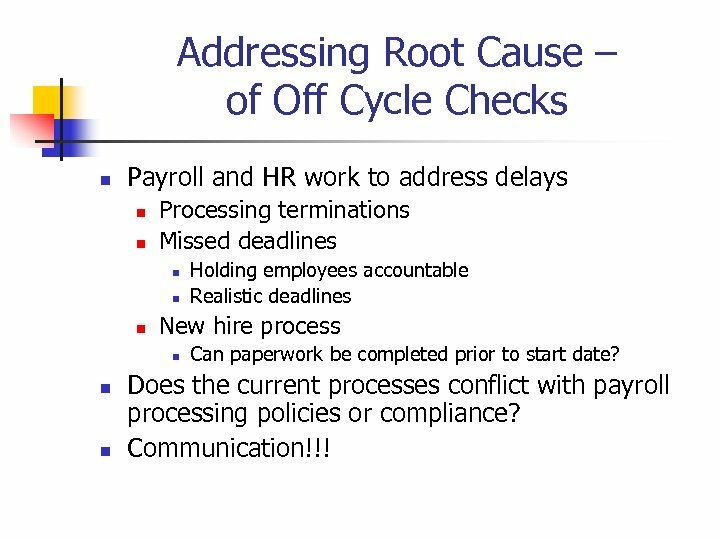 Addressing Root Cause – of Off Cycle Checks n Payroll and HR work to address delays n n Processing terminations Missed deadlines n n n New hire process n n n Holding employees accountable Realistic deadlines Can paperwork be completed prior to start date? 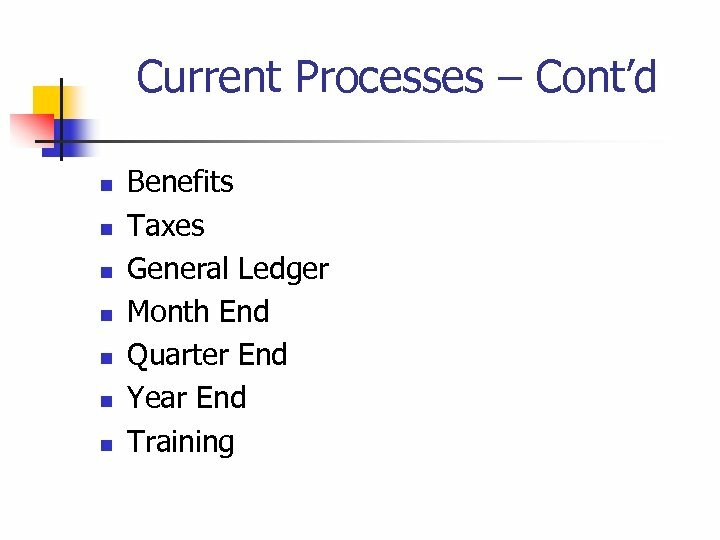 Does the current processes conflict with payroll processing policies or compliance? 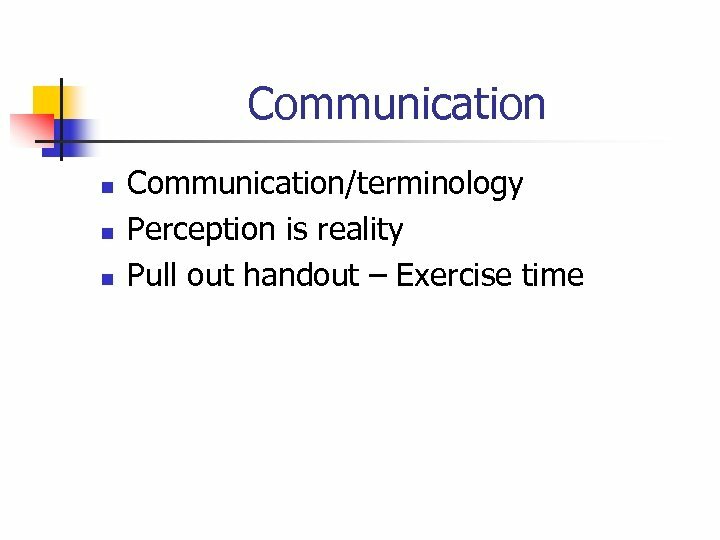 Communication!!! 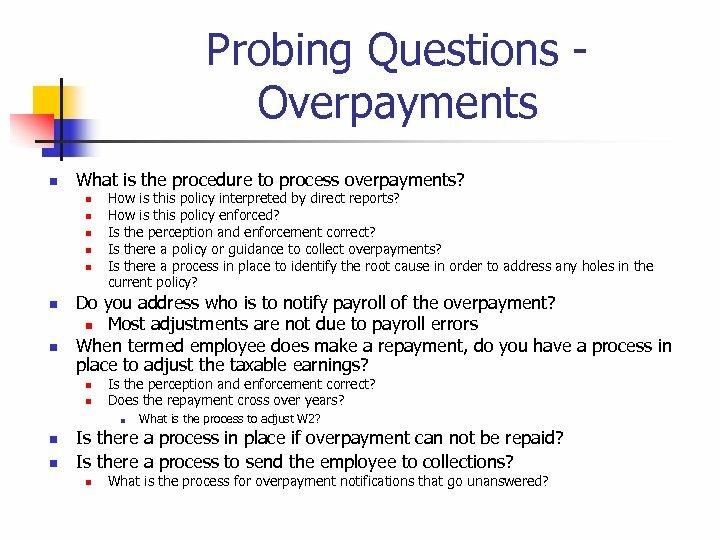 Probing Questions - Overpayments n What is the procedure to process overpayments? n n n n How is this policy interpreted by direct reports? How is this policy enforced? Is the perception and enforcement correct? Is there a policy or guidance to collect overpayments? 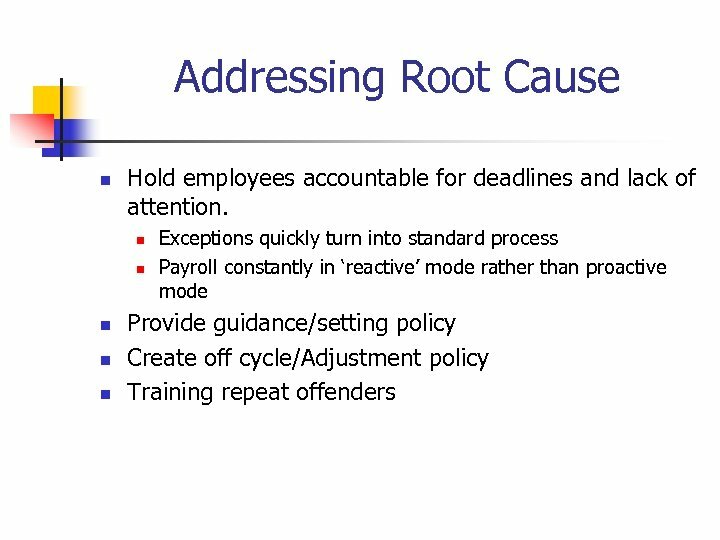 Is there a process in place to identify the root cause in order to address any holes in the current policy? 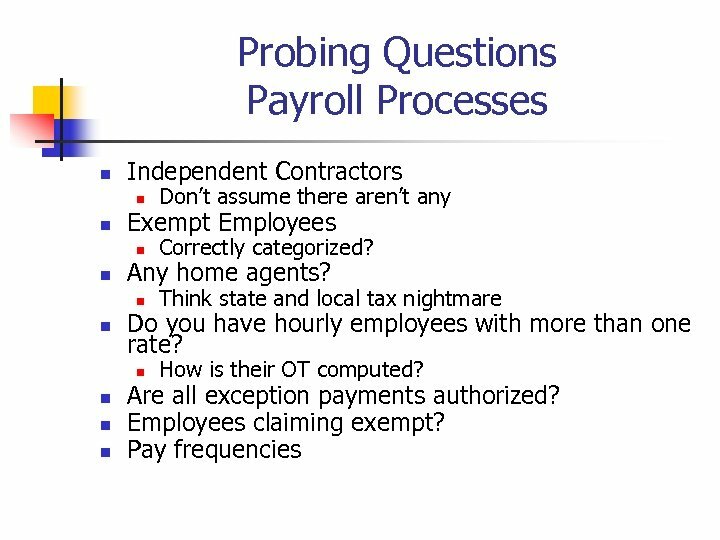 Do you address who is to notify payroll of the overpayment? 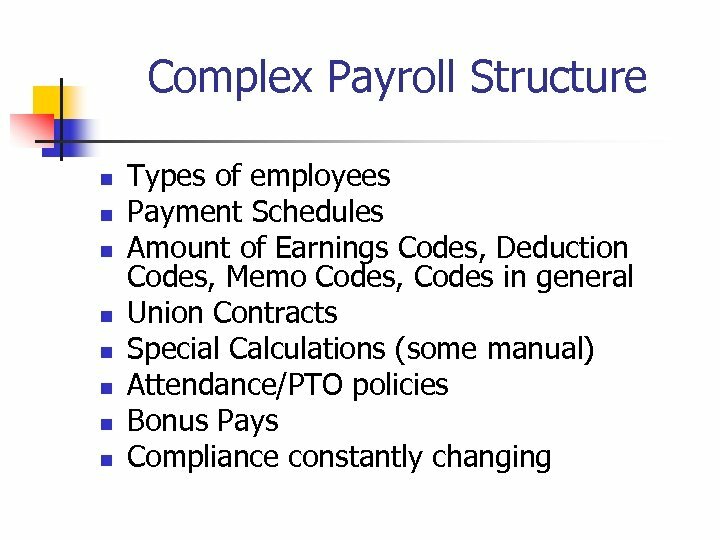 n Most adjustments are not due to payroll errors When termed employee does make a repayment, do you have a process in place to adjust the taxable earnings? n n Is the perception and enforcement correct? Does the repayment cross over years? 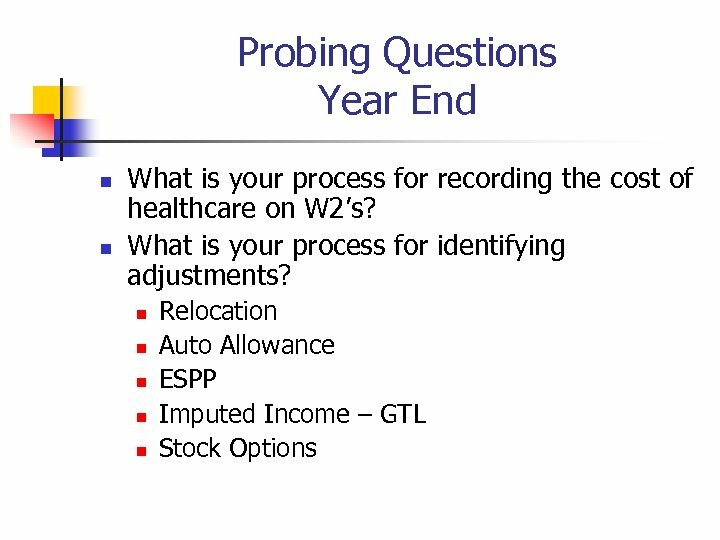 n n n What is the process to adjust W 2? Is there a process in place if overpayment can not be repaid? Is there a process to send the employee to collections? n What is the process for overpayment notifications that go unanswered? 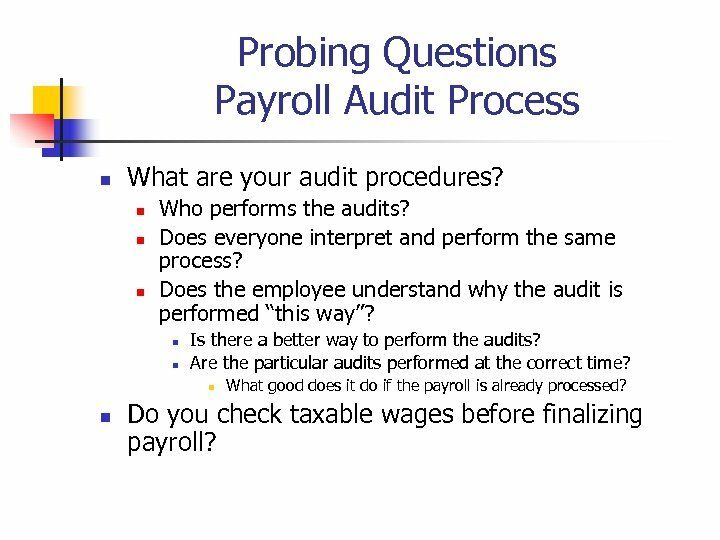 Probing Questions Payroll Audit Process n What are your audit procedures? n n n Who performs the audits? 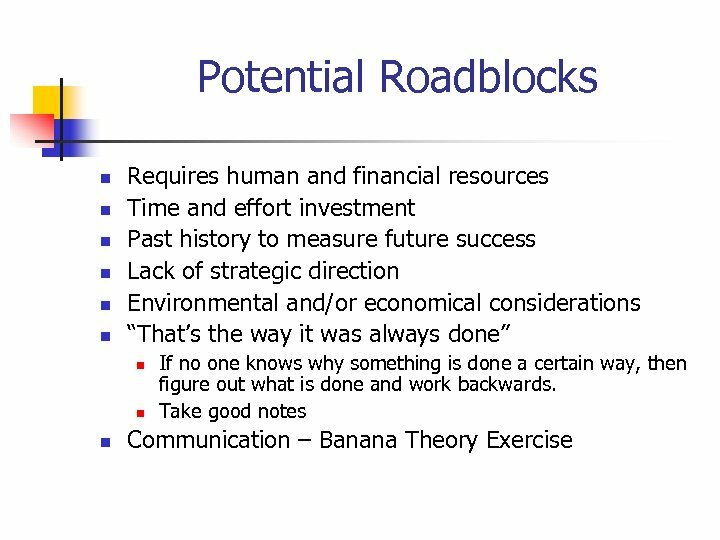 Does everyone interpret and perform the same process? 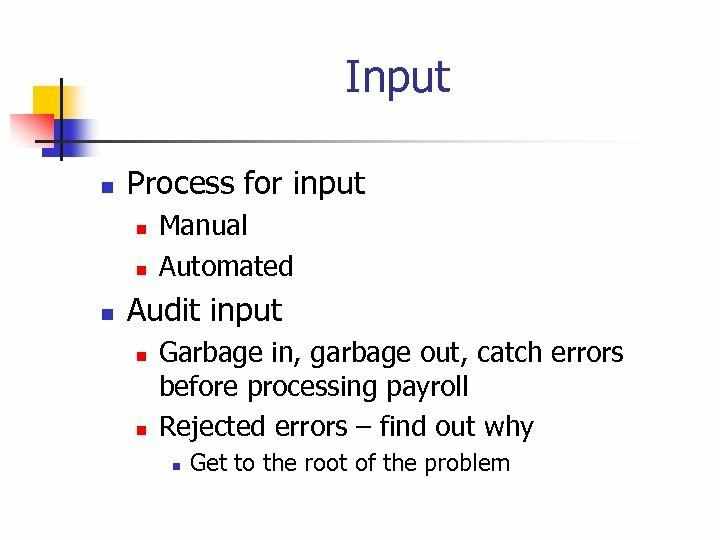 Does the employee understand why the audit is performed “this way”? 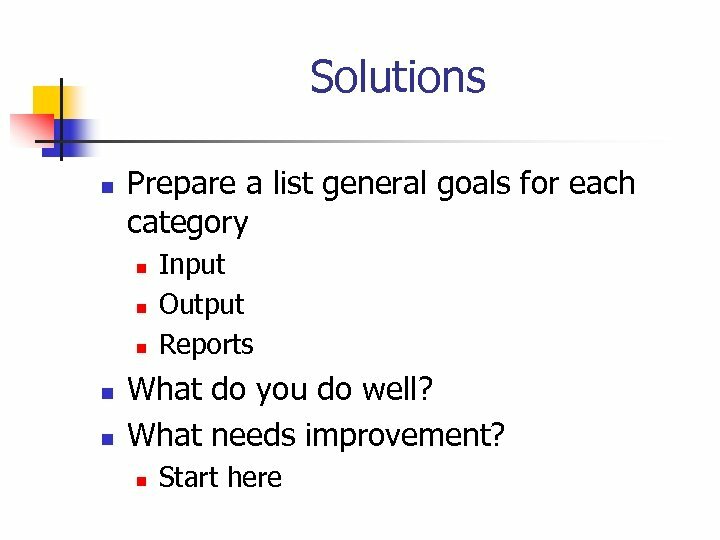 n n Is there a better way to perform the audits? 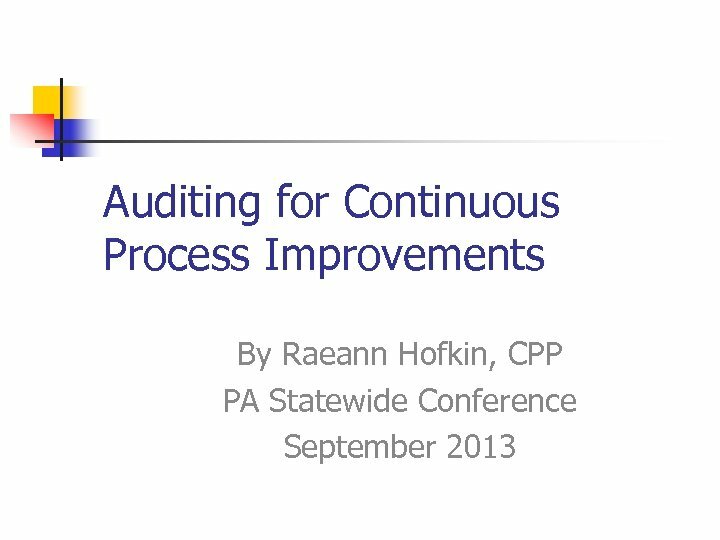 Are the particular audits performed at the correct time? 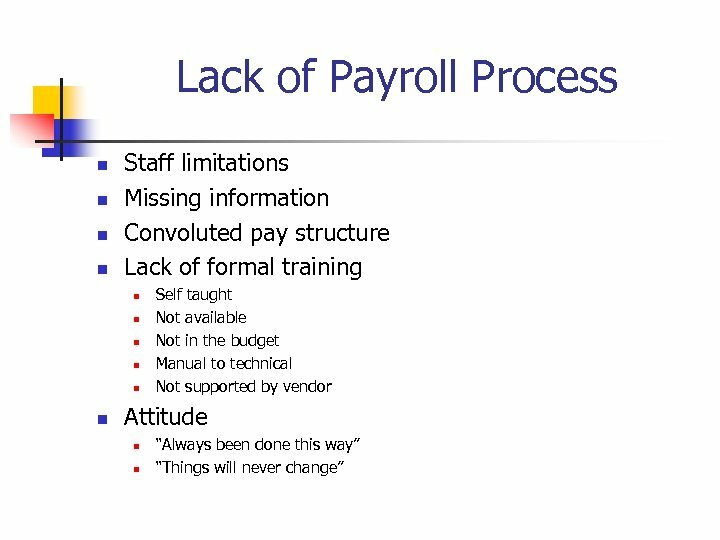 n n What good does it do if the payroll is already processed? 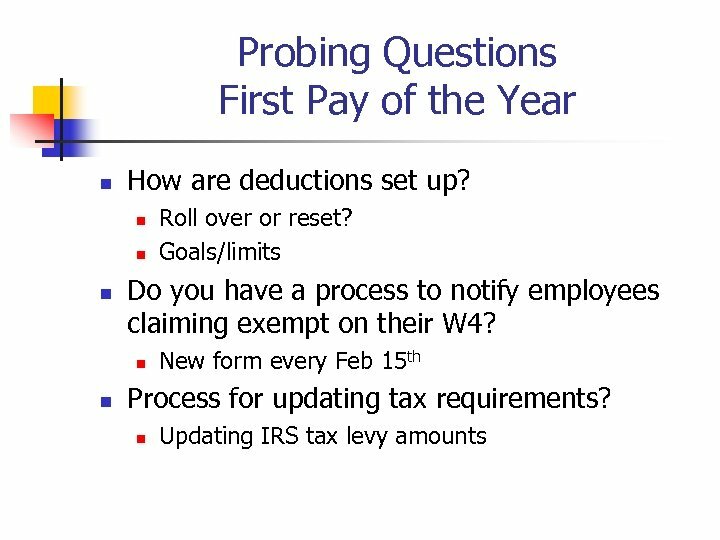 Do you check taxable wages before finalizing payroll? 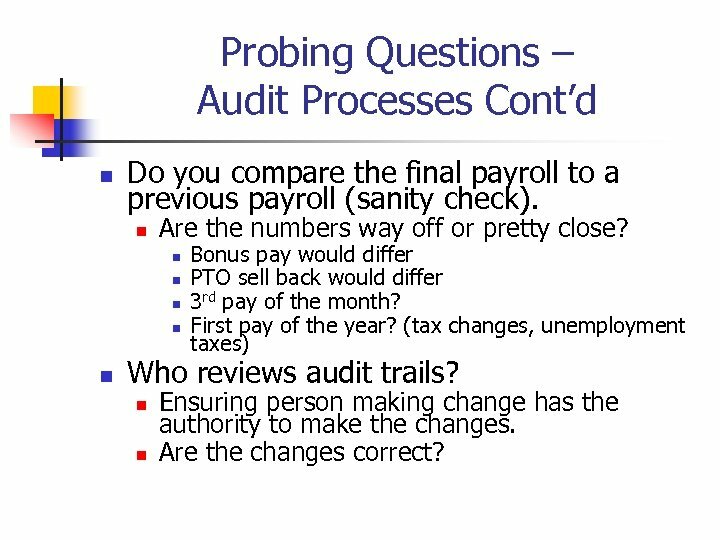 Probing Questions – Audit Processes Cont’d n Do you compare the final payroll to a previous payroll (sanity check). n Are the numbers way off or pretty close? n n n Bonus pay would differ PTO sell back would differ 3 rd pay of the month? First pay of the year? (tax changes, unemployment taxes) Who reviews audit trails? n n Ensuring person making change has the authority to make the changes. Are the changes correct? 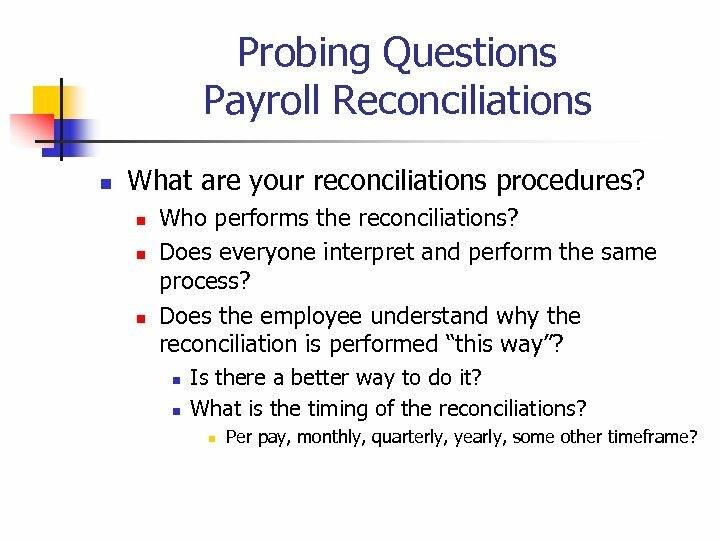 Probing Questions Payroll Reconciliations n What are your reconciliations procedures? n n n Who performs the reconciliations? Does everyone interpret and perform the same process? 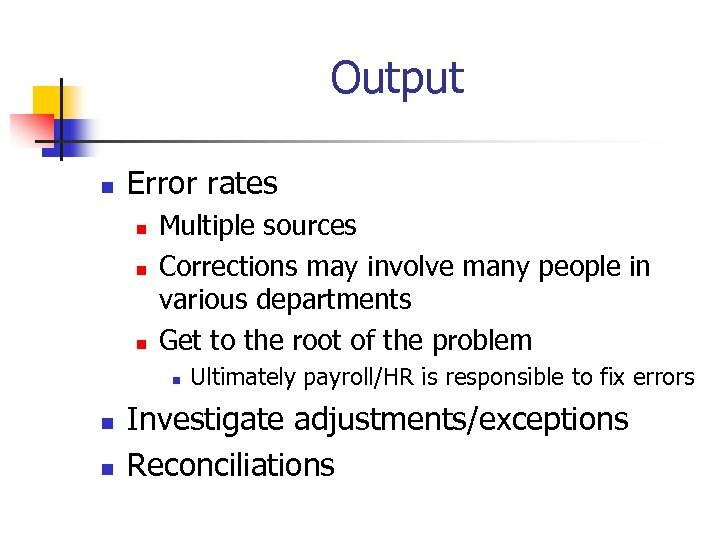 Does the employee understand why the reconciliation is performed “this way”? n n Is there a better way to do it? What is the timing of the reconciliations? n Per pay, monthly, quarterly, yearly, some other timeframe? 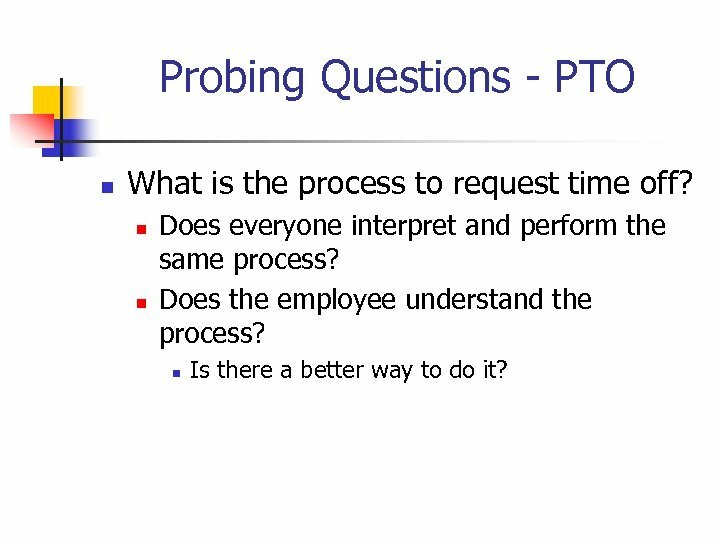 Probing Questions - PTO n What is the process to request time off? n n Does everyone interpret and perform the same process? Does the employee understand the process? n Is there a better way to do it? 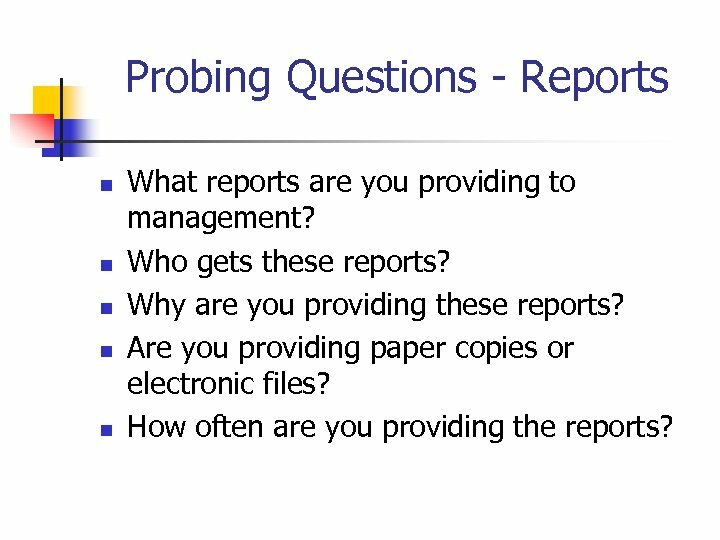 Probing Questions - Reports n n n What reports are you providing to management? 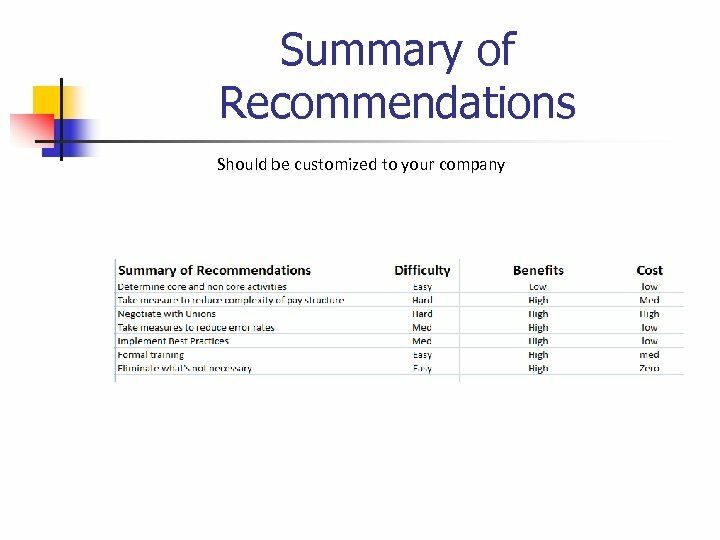 Who gets these reports? 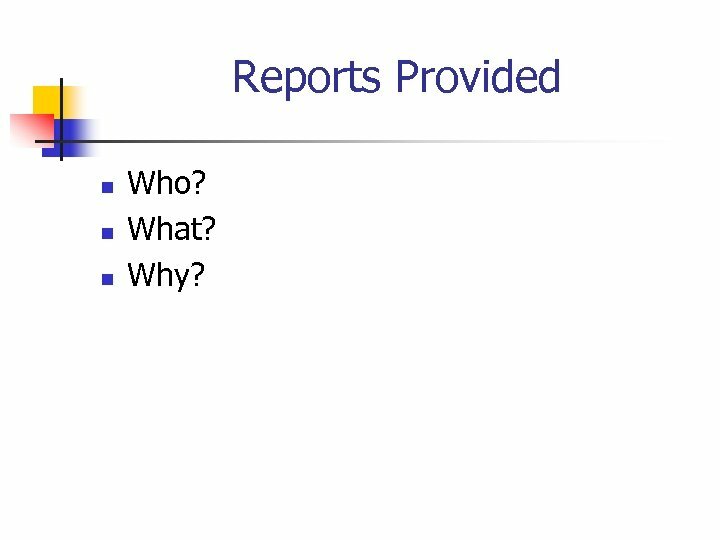 Why are you providing these reports? Are you providing paper copies or electronic files? 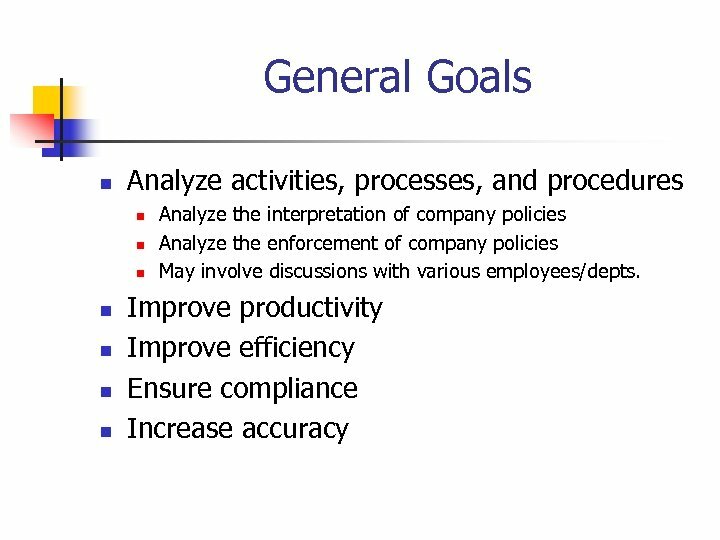 How often are you providing the reports? 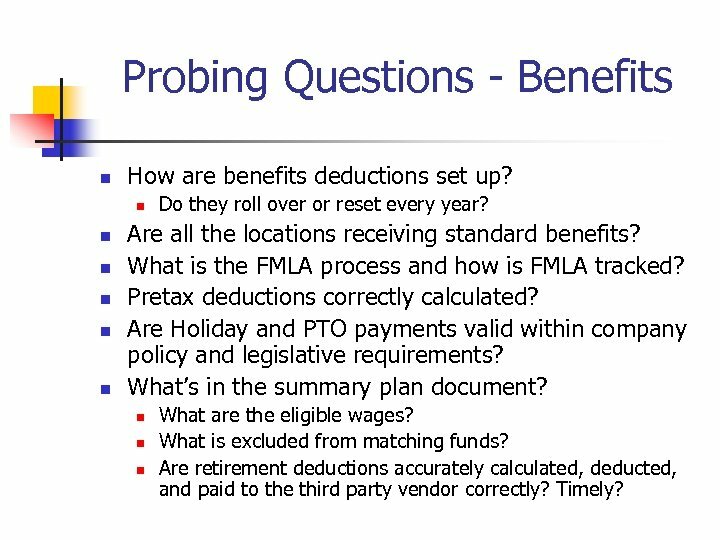 Probing Questions - Benefits n How are benefits deductions set up? n n n Do they roll over or reset every year? Are all the locations receiving standard benefits? 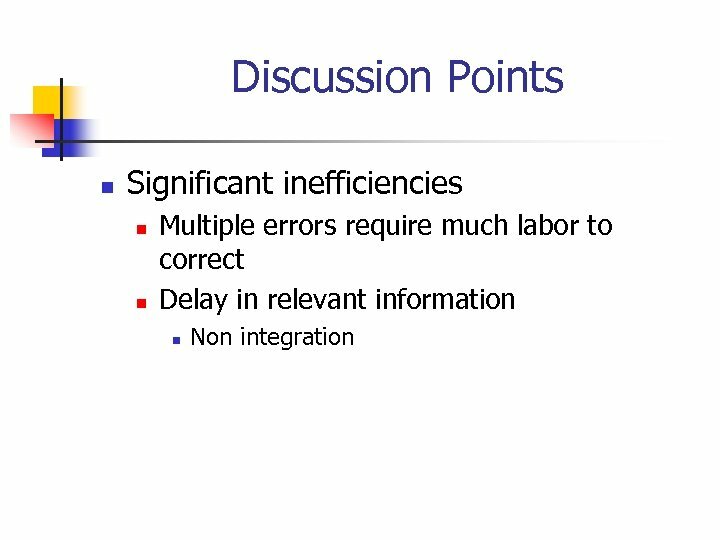 What is the FMLA process and how is FMLA tracked? Pretax deductions correctly calculated? Are Holiday and PTO payments valid within company policy and legislative requirements? 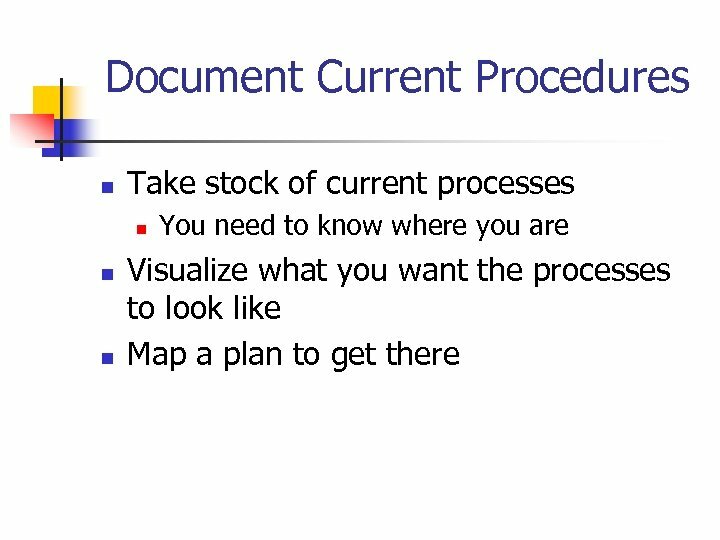 What’s in the summary plan document? n n n What are the eligible wages? What is excluded from matching funds? Are retirement deductions accurately calculated, deducted, and paid to the third party vendor correctly? Timely? 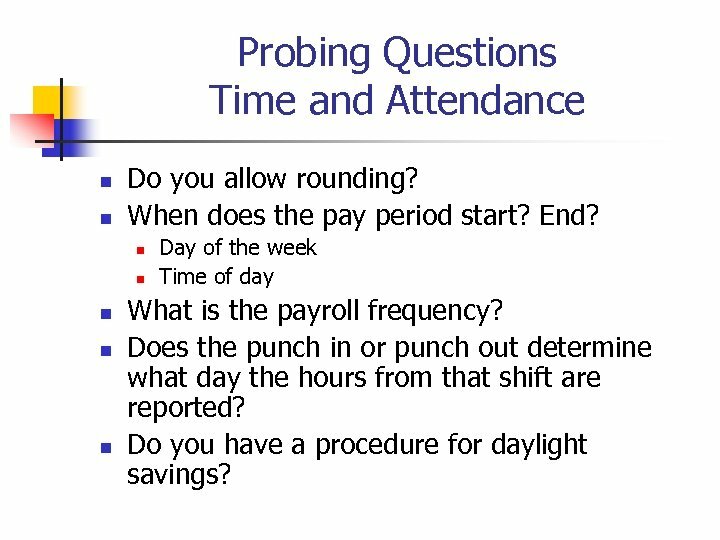 Probing Questions Time and Attendance n n Do you allow rounding? When does the pay period start? End? 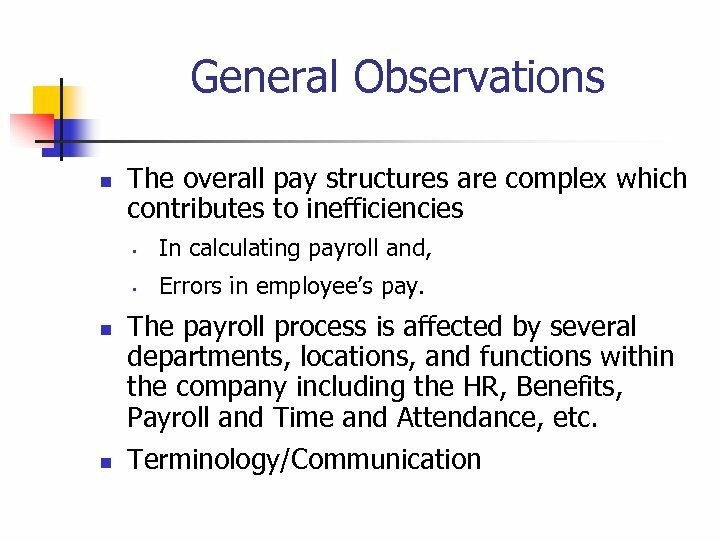 n n n Day of the week Time of day What is the payroll frequency? Does the punch in or punch out determine what day the hours from that shift are reported? Do you have a procedure for daylight savings? 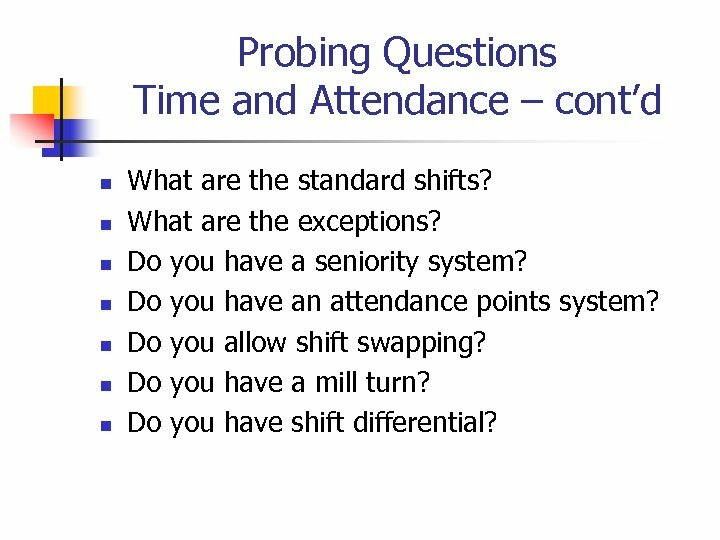 Probing Questions Time and Attendance – cont’d n n n n What are the standard shifts? What are the exceptions? Do you have a seniority system? Do you have an attendance points system? Do you allow shift swapping? Do you have a mill turn? Do you have shift differential? 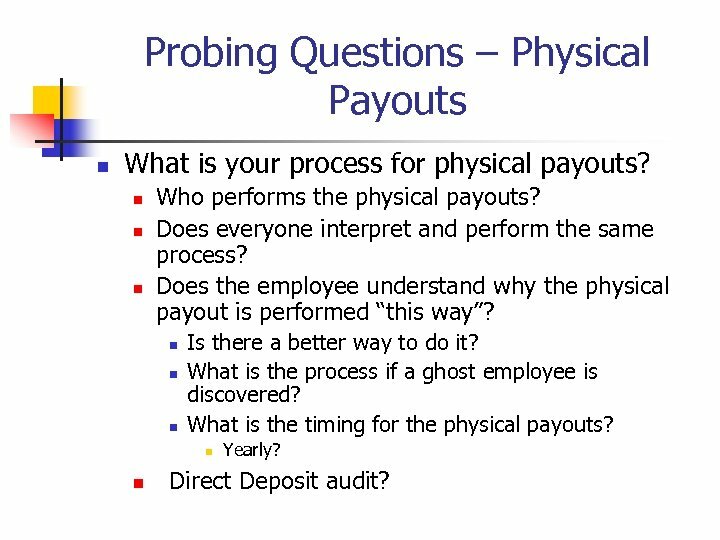 Probing Questions – Physical Payouts n What is your process for physical payouts? n n n Who performs the physical payouts? 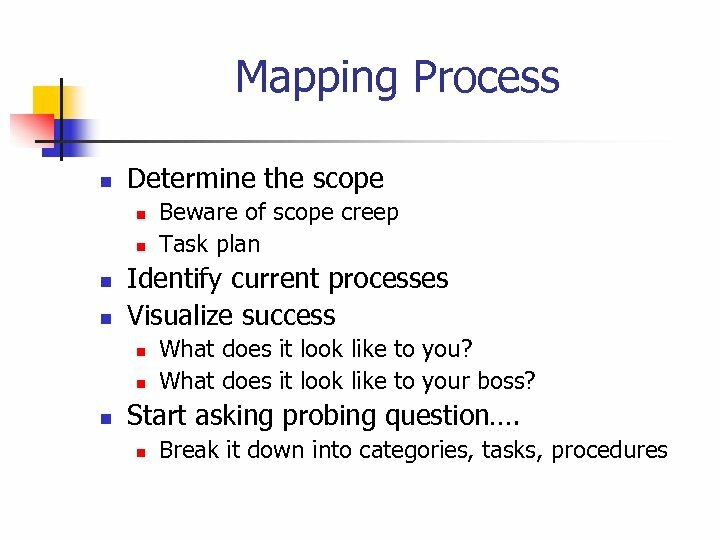 Does everyone interpret and perform the same process? Does the employee understand why the physical payout is performed “this way”? n n n Is there a better way to do it? What is the process if a ghost employee is discovered? What is the timing for the physical payouts? n n Yearly? Direct Deposit audit? 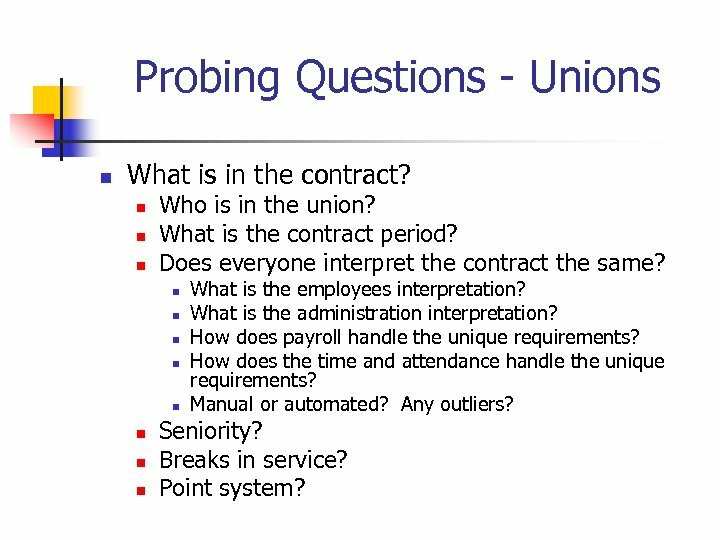 Probing Questions - Unions n What is in the contract? n n n Who is in the union? What is the contract period? Does everyone interpret the contract the same? n n n n What is the employees interpretation? What is the administration interpretation? 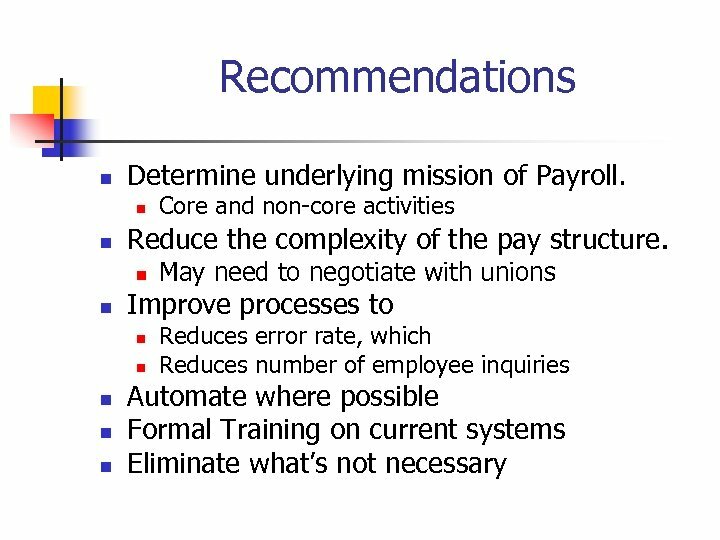 How does payroll handle the unique requirements? How does the time and attendance handle the unique requirements? 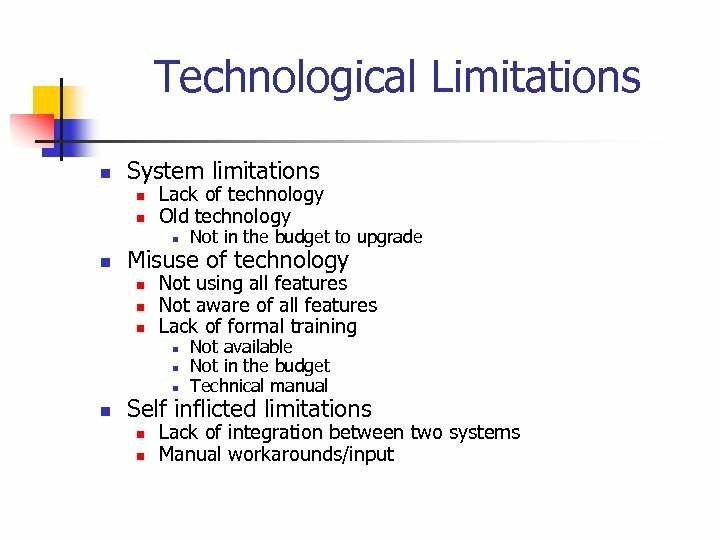 Manual or automated? Any outliers? Seniority? Breaks in service? Point system? 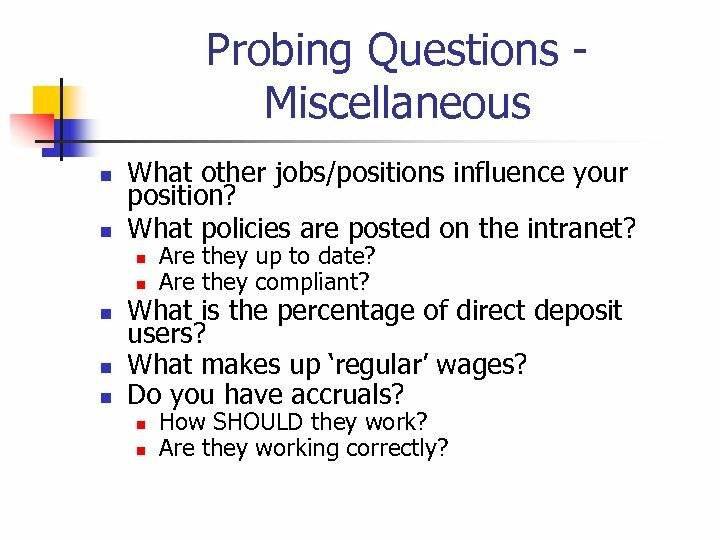 Probing Questions - Miscellaneous n n What other jobs/positions influence your position? 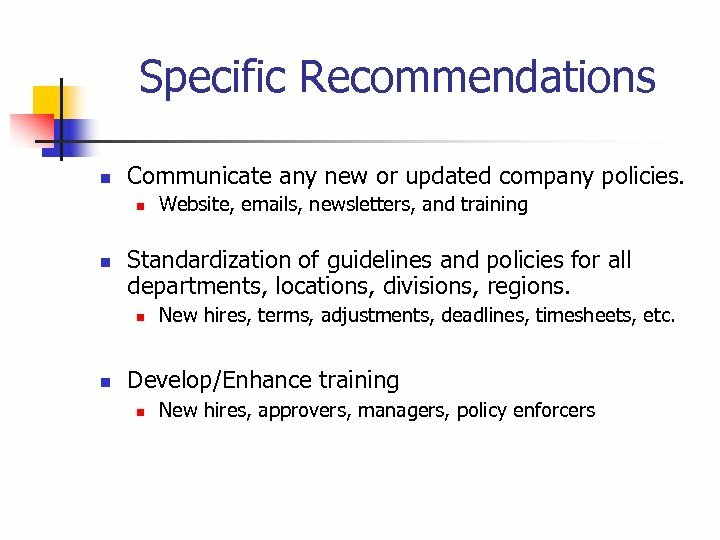 What policies are posted on the intranet? n n n Are they up to date? Are they compliant? What is the percentage of direct deposit users? What makes up ‘regular’ wages? 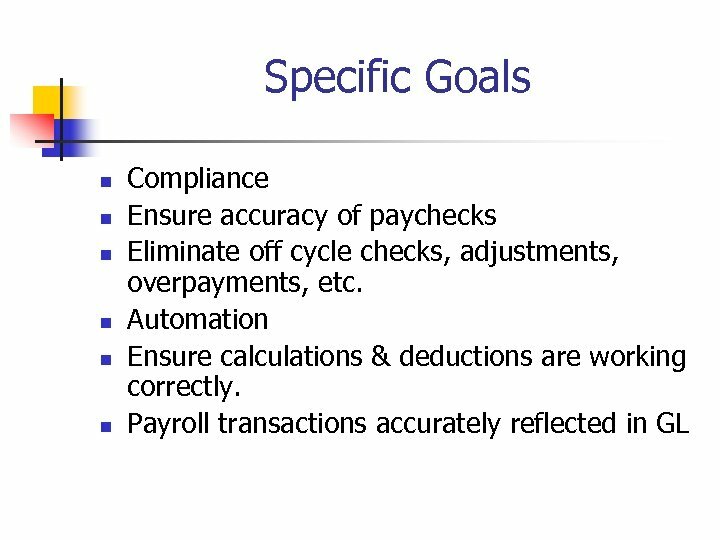 Do you have accruals? n n How SHOULD they work? Are they working correctly? 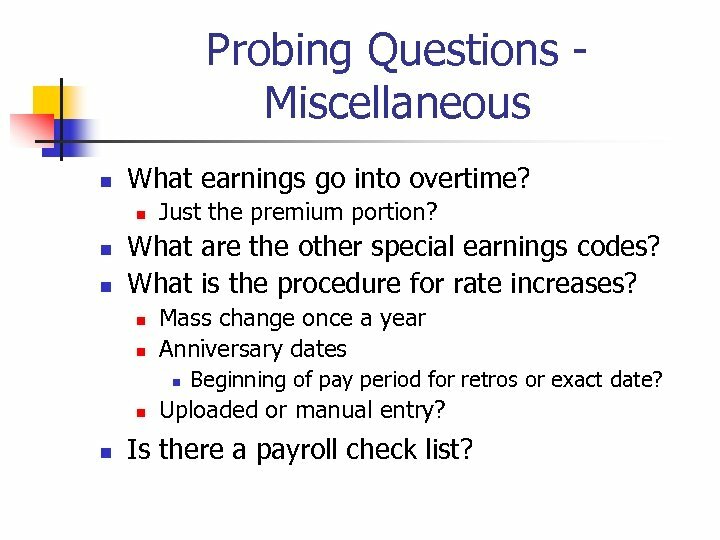 Probing Questions - Miscellaneous n What earnings go into overtime? n n n Just the premium portion? What are the other special earnings codes? What is the procedure for rate increases? n n Mass change once a year Anniversary dates n n n Beginning of pay period for retros or exact date? Uploaded or manual entry? Is there a payroll check list? 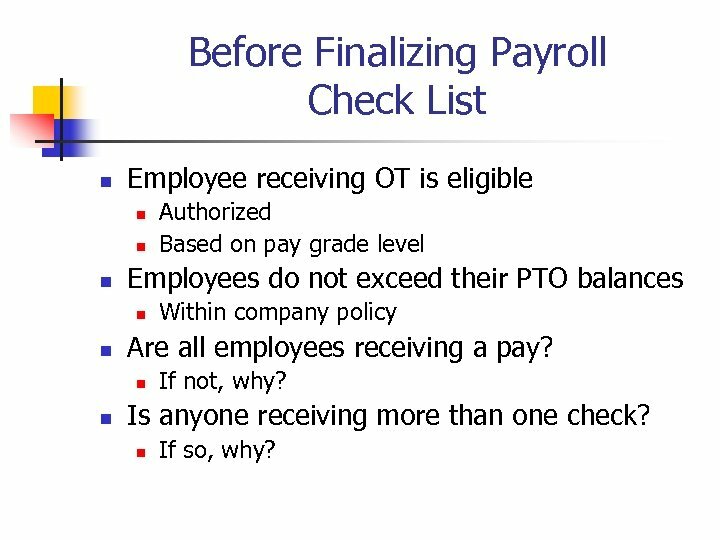 Before Finalizing Payroll Check List n Employee receiving OT is eligible n n n Employees do not exceed their PTO balances n n Within company policy Are all employees receiving a pay? n n Authorized Based on pay grade level If not, why? Is anyone receiving more than one check? n If so, why? 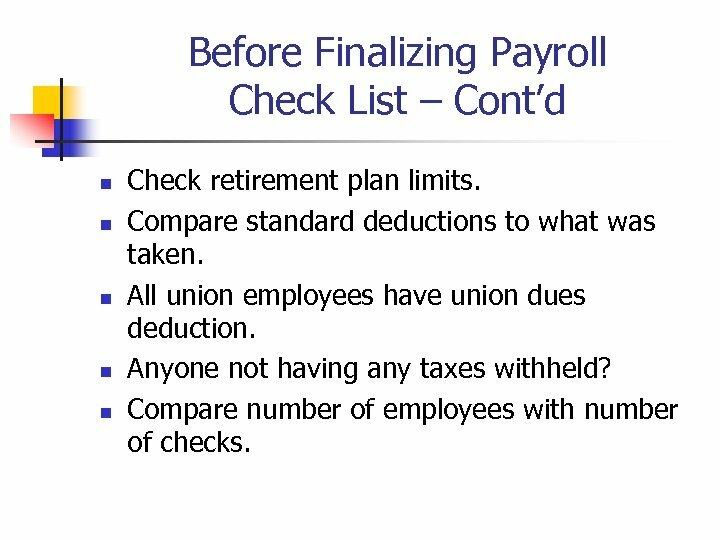 Before Finalizing Payroll Check List – Cont’d n n n Check retirement plan limits. Compare standard deductions to what was taken. All union employees have union dues deduction. Anyone not having any taxes withheld? Compare number of employees with number of checks. 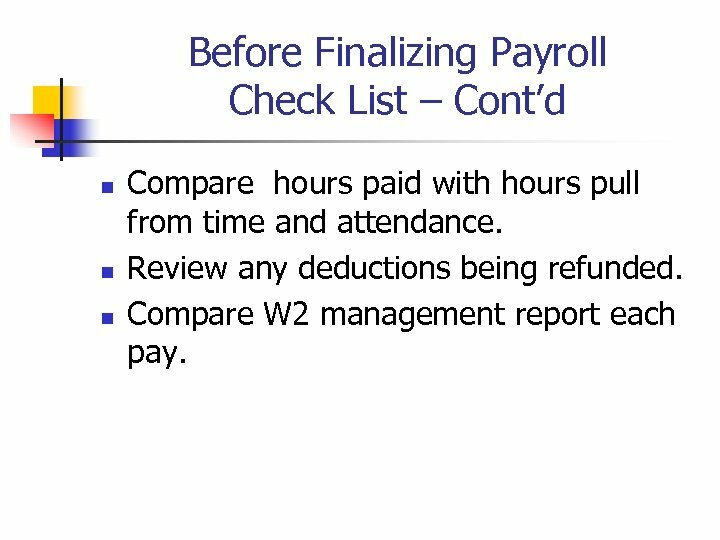 Before Finalizing Payroll Check List – Cont’d n n n Compare hours paid with hours pull from time and attendance. Review any deductions being refunded. 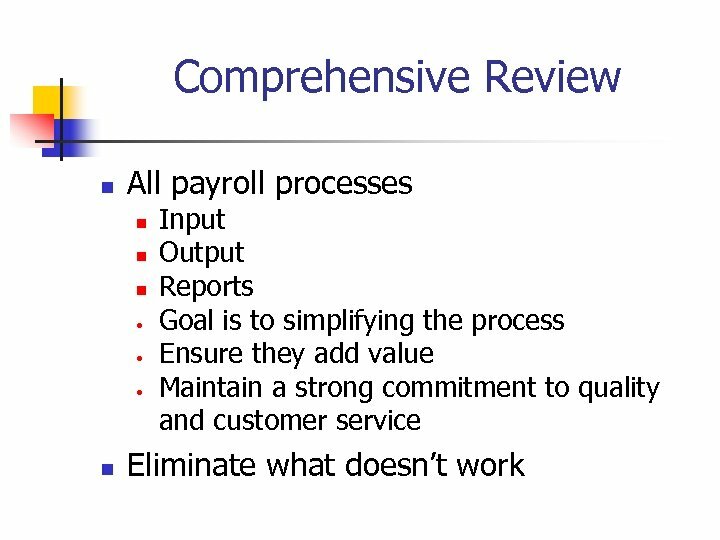 Compare W 2 management report each pay. 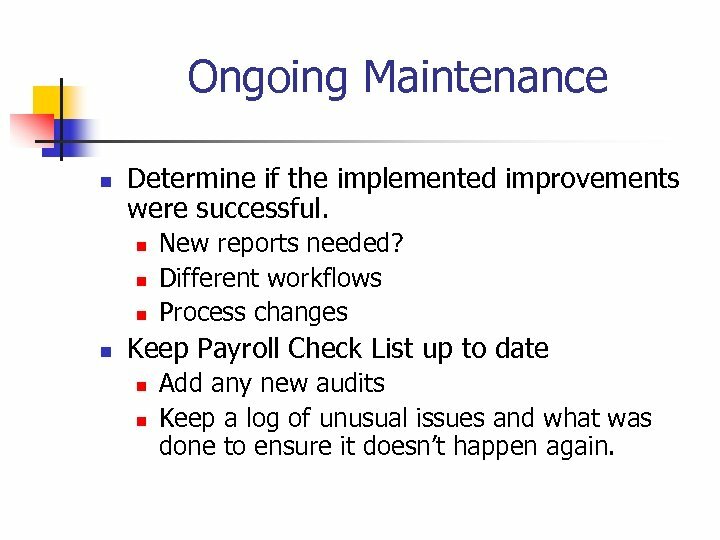 Ongoing Maintenance n Determine if the implemented improvements were successful. n n New reports needed? 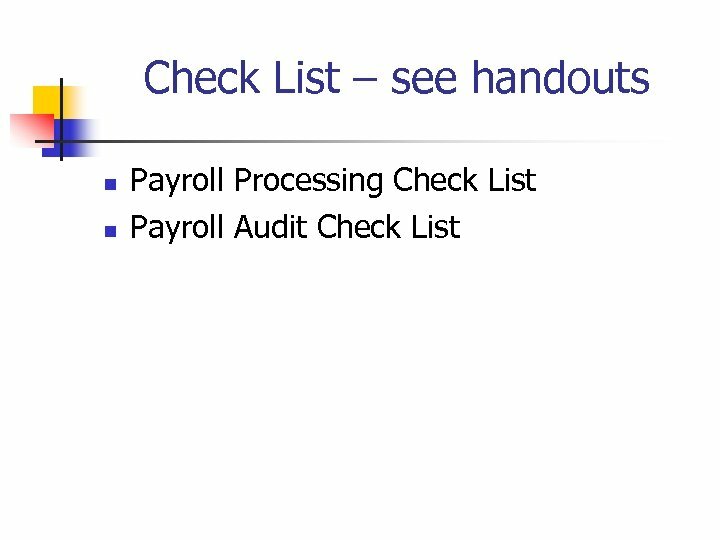 Different workflows Process changes Keep Payroll Check List up to date n n Add any new audits Keep a log of unusual issues and what was done to ensure it doesn’t happen again. Any Questions? n n n What stories do you have to share? What did you learn the hard way? 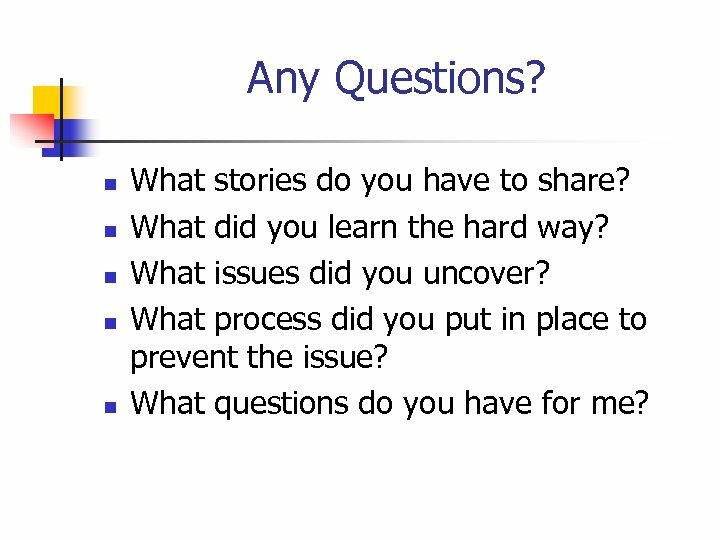 What issues did you uncover? What process did you put in place to prevent the issue? What questions do you have for me?